It’s finally published. 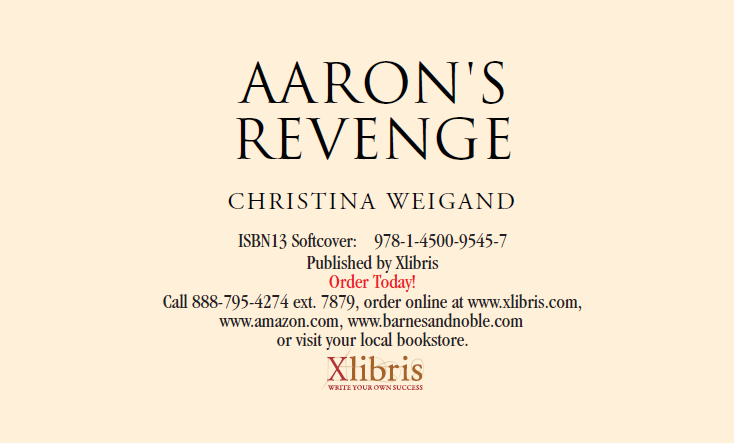 Aaron’s Revenge is available at Xlibris. Check it out and let me know what you think. Aaron grew up believing he was a farmer’s son and destined to be a low-level knight in Crato. 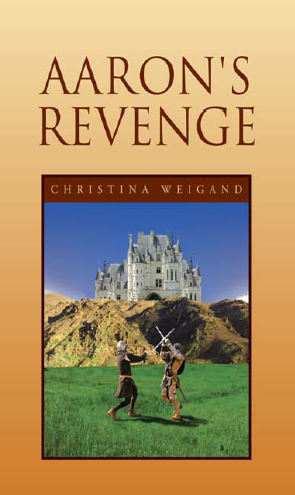 Then on his fi fifteenth birthday his world is torn from him when he is kidnapped and thrown into a world of deception and magic. His sibling rivalry with Tomas pales in comparison to the challenges he’ll face in the search for his identity and destiny. Enit grew up a princess and without the love of her Father. When her long-lost brother is found she embarks on a journey to fi nd a relationship with her brother and win the love of her father. I have stumbled, I have fallen. My life is boring, my job is going nowhere. Guess what God is at your side. Yep right beside you, holding your hand taking on the boredom, creating opportunities to go somewhere. That place is with Him in His house. He is with you every single day in this life and the life beyond. Let Him walk with you, be your support, be your guide. He is there for you. God believes in you. He doesn’t care how you look, He doesn’t care where you live. He forgives your sins when you ask. You are a very special person to Him. He knows you will struggle, you will fall, but He is there to pick you up. He created you with a very special purpose in mind and He believes that you will fulfill it. Follow His lead, Believe in Yourself and all that He has created for you. If He didn’t think you could do it, He would not have put it on your soul to do it. Believe in yourself, God does. Say this little prayer when in doubt: God let me see myself through your eyes. We hear it all the time and it has almost become trite, but it is still the truest statement one can make. It has been proven over and over again and yet we struggle with the message. The message Love can transform the world. Simple yet so elusive. The thing is, for our own salvation, we need to find a way to grasp this message and put it to work in our lives. So how do we do that, pray for guidance from the Holy Spirit and then with His help love everyone, friend or foe, lovable and unlovable, sinners and saints. Destroy fear, depression and despair with joy and praise. Drive out sin with love. Book Review: What Did Jesus Say? This book is a good resource for young teens who want to know what Jesus had to say about situations that they find themselves in today. It gives many scripture references along with stories of people in today’s world that handle the situation with a Christian attitude. It shows teens that it’s okay to be Christian and not go with the flow of their non-Christian counterparts. The book covers 62 topics ranging from abandonment to worthiness and all subjects in between. It is presented in a no nonsense manner that is easy for teens to understand and relate too. The adults can also relate to it by seeing where teens heads are at. I even used the book to write a short devotional when I was searching for answers and I am far from a teen. I highly recommend this book for teens and anyone who is dealing with teens. To comply with new regulations introduced by the Federal Trade Commission, please mention as part of every Web or Amazon review that Tyndale House Publishers has provided you with a complimentary copy of this book or ARC. Simple yet powerful. If we can do nothing else, the least we can do is pray. When you wake in the morning before you begin your day, offer it up to God in prayer. Before you say those harsh words, say a prayer. While you rock the baby to sleep, say a prayer. Every moment of every day offer up in prayers of thanksgiving and praise for our Lord Jesus Christ. Link your soul, mind and heart to God. Be secure in your faith and know that He is there and He hears. Thank you to all the people who have died to secure and maintain the freedom that we have in America. May God watch over them and take them into His loving embrace.